Recently, I was overjoyed to see a black nightshade plant growing in our apartment complex, all by itself. 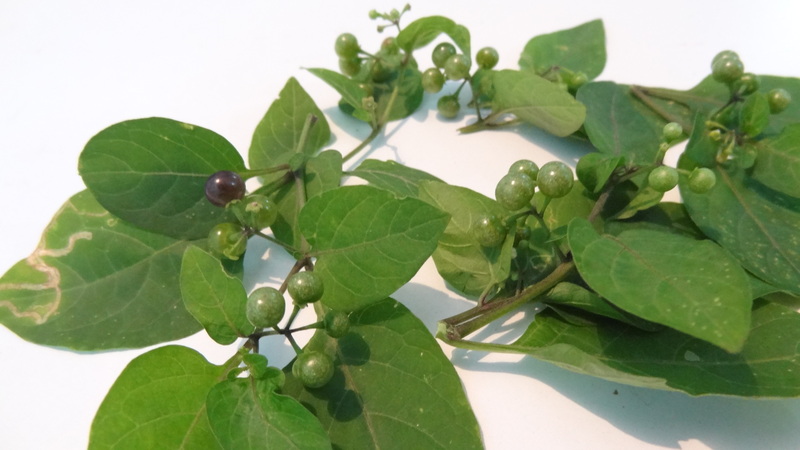 Black nightshade aka Solanum Nigrum, popularly known in Tamil as Manathankali, is a weed commonly found in South India. I have had some wonderful times eating the berries right off the plant in my grandparents’ backyard, holidaying in Madras as a child. I remember my Patti plucking the leaves off and making them into a delicious kootu. Back home in Ahmedabad, mananthankali leaves or berries would not be available, and so I never got to eat them. I haven’t seen them ever in Bangalore either, so the curry remained forgotten. till I accidentally discovered a plant growing in my very own compound. Black nightshade leaves have medicinal properties – they are good anti-inflammatory elements, and can help soothe mouth ulcers as well as several ailments of the digestive system. Not only the leaves, but the berries of the plant too can be consumed. The berries can be eaten raw, and when dried, they can be used in other preparations like vathal kozhambu and the like. One must be careful while plucking these leaves by oneself, though. There are several plant species related to the black nightshade, some of them scarily similar-looking, which are poisonous. The leaves of some other related species are known to produce ill effects – hallucinations, dizziness, nausea, etc. – when consumed. Amma and I know how to recognise the edible species very well, and so we had no qualms on that front. I decided to make keerai kootu (a liquidy mild-flavoured curry) out of the greens, adding in some of the raw berries that we foraged too. It turned out delicious! This was my first time cooking manathankali greens, and I am pretty sure it is not going to be the last, as long as I am able to find them. We have traditionally used fresh, grated coconut to make this kootu, but this time around, I used ready-made coconut milk, taking the cue from several recipes on the Internet. This made the kootu super-easy to make. It tasted nice and creamy, soothing, simple stuff for a palate that is tired after a lot of rich food. The next time around, I might decide to make this kootu with fresh coconut instead of coconut milk, though. Heat the oil in a small pressure cooker. Add the mustard seeds and allow them to splutter. Add the asafoetida. Add the chopped onions and crushed garlic. Saute for a minute or two, till the raw smell goes away. Add the chopped tomatoes. Cook with a bit of water, till they turn mushy. Meanwhile, wash the moong dal thoroughly. Drain out the excess water. Keep aside. 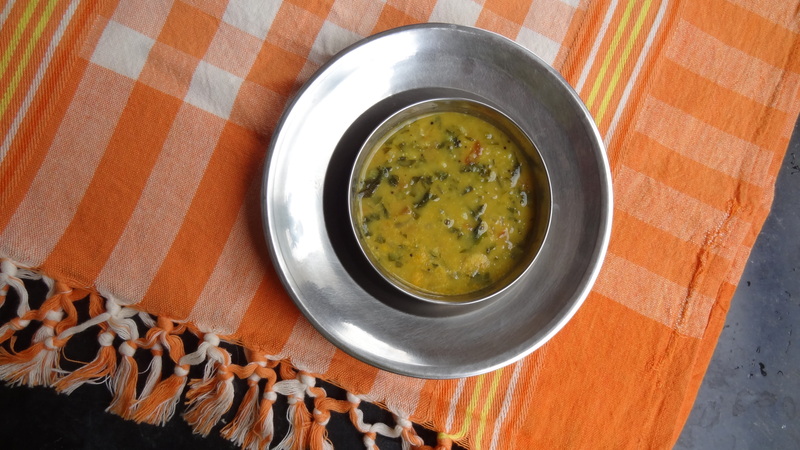 Add the chopped mananthankali greens and washed moong dal, along with the green chillies, salt and red chilli powder to taste, and turmeric powder. Mix well. Add about 1 glass of water. Mix well. Close the lid of the pressure cooker and put the whistle on. Let it cook for 4-5 whistles. Once the steam has released, open the pressure cooker. Switch on the gas and add the coconut milk. Mix well. Let the kootu cook till it starts bubbling. Switch off the gas at this point. Serve with jeera rice or plain, white rice, hot. Have you ever cooked nightshade greens? How do you do it? I was looking for “Kasi soppu” as described by my maid (originally from TN, now in Blr), when your link came up in google. I found this plant growing by itself in my backyard, and today when I asked my gardener to pull it up and throw it, thinking its a weed, he and my told me that this is an edible plant. I read your post, but am concerned that there could be other plants very similar that could be poisonous. Would you mind if I send you a picture of the plant, can you help identify if this is indeed the same plant? Sure, please do. I will try to help you the best way I can. I’ve cooked these greens quite a few time. I add it to my sambhar.you do find this “soppu ” in bangalore.My local veggie guy sells them. I’ve never asked its name . will do the next time i buy it. Oh, I see. I haven’t seen them yet in Bangalore. Thanks for letting me know. It is called “kasi soppu”. Bought it today.